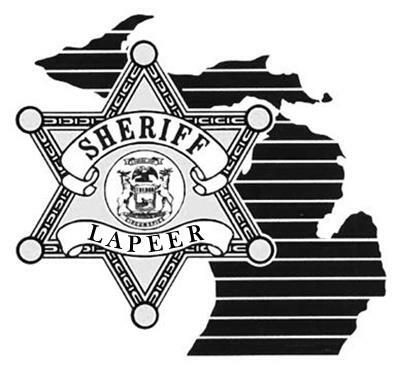 On Thursday 12-10-2015 at 7:53 PM, Lapeer County Sheriff’s Deputies were requested to assist Child Protective Service (Department of Human Services) with a welfare check involving a child on Westbrooke Drive in Lapeer (Mayfield Township). The home owner (38 male from Lapeer) refused to grant entry. Probable cause was developed reference illegal narcotics during the initial contact. A search warrant was sought and granted to enter the residence. Deputies seized illegal marijuana and analogues with a street value of approximately $26,000. 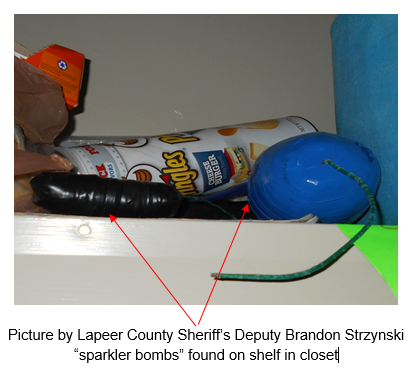 Four what is commonly referred to as “sparkler bombs” (metal sparklers attached together with black electrical tape creating an explosive device that will disperse shrapnel) were located in a closet. The Michigan State Police Bomb Squad was contacted and responded to the residence. The home owner and a friend (also male age 38 from Lapeer) possessed the explosive devices for their use and are not known to be connected to any organized group. Michigan has criminal laws (classified as a felony) relating to explosive devices. The child was removed from the residence. Both individuals were released pending further investigation and their names are withheld until they are formally charged. The explosive devices and illegal narcotics remain under investigation by the Lapeer County Sheriff’s Office.